Technology Jio Tv New Update Brings Better Interface and HD Cricket Streaming. Jio Tv New Update Brings Better Interface and HD Cricket Streaming. Jio Tv is the most used live streaming app for smartphones to watch tv channels. The most popular Jio tv with its frequent updates to make it more and more popular, and is the installed app for all Jio SIM users in india. Jio tv app is the most popular in india, even though there are so many apps in the similar category. Why? Because Jio tv app provides better services than any other competitive apps in the market. Now the total of 342 channels in the Jio tv app list to watch from. Almost 80% of the channels available in the list is regional indian channels, and will add much more channels in coming updates. Jio tv smartphone app provides better user interface to use the app very smooth. The app have the best graphical user interface the users can get their favorite content. Because the Jio tv is used by millions of users in india belongs to various languages and culture, so the users can be able to select the channels by just using the drop down select. If the user is from tamil nadu and he wants to filter all the tamil channels, just need to select the category tamil from the drop down, and can catch his favorite channels from the filtered list. And if the user want to use again filter, to filter the news category in Tamil, then he can use the another drop down filter to select the channels categories and the list have various categories like sports, movies, music, devotional, news, kids etc. Jio tv app streams the channels without any buffering issue since the app works only with Jio VoLTE network. Hd channels are also available, and the user have all the privilege to use in hd mode or normal mode so that the users can be able to control the data usage. In addition to Jio tv, Jio provides Jio cinema service via the Jio cinema app, to watch the streaming movies from the collection of their library. Catch Up Features allows the users to enjoy the missed episodes of their favorite at any time in the next seven days. Need not to be worry if they have missed their favorite shows any reason. This is the one of the best features Jio tv smartphone app users like. The live sports actions you missed can be watch with the catch up section. Recent Jio Tv app Updates in 2019 with new Interface and Features Jio frequently updating Jio tv app for the Jio users. 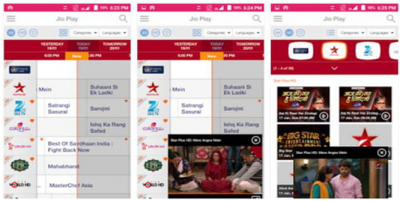 When at the time of launch, Jio tv offered only 350 channels only and when at the every time they update the app, more and more channels are added in the channels list. Now Jio tv have the copyright to almost all the biggest channels networks in india like zee, sun network, star network etc. In recent Jio tv smartphone app update, the better user interface with added Jio cricket features. Now the Jio SIM users can enjoy all the Indian Team matches without going any channel. Jio provides Jio cricket, so that from the app interface, the users can direct land to the cricket streaming. The channels for these streaming available for the 4 regional languages. Already, Jio provides sports channels in regional language also. Featured content is scrolling over the slider in the Jio tv app interface, so easy navigate to those content just tap the content. The update available for both the iOS and android versions. The easy to navigation is the new features for the cricket lovers. Search box is available to get the channels with just single search. The users need not to pay any additional charges to use the Jio tv channels and can enjoy with the Data pack they are using. Jio tv is the pure goldmine for the entertainment lovers in india, to watch the favorite tv channels without any extra charge other than their data charge. Almost all the indian regional channels are in the list to enjoy, and can be expect to add more channels. Jio making the long term partnership with the media channels network, so that the users can enjoy the contents long time. Just download the Jio tv app and enjoy your favorite channels free.